Fertilizing you lawn properly? Tested your soil lately? Give your lawn the VIP Treatment. Is your lawn maintenance company certified? When applied improperly or in excess, fertilizers can wash off or leach into nearby storm drains, water bodies or even into our aquifer. Learn more about what you can do to prevent this type of pollution and preserve Marion County’s rivers, lakes and springs for generations to come. View more photos of what we are protecting. 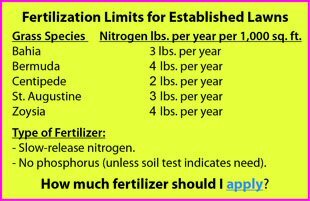 The Marion County Fertilizer Education Program is a public service of the Marion County Board of County Commissioners. 2012.